A regular water bottle can be recycled and used to demonstrate many different types of hands-on science experiments. Science experiments allow students to do preassessments on what they are studying and then conduct experiments to see if they were right. Other benefits of conducting science experiments are hands-on learning, development of higher level or critical thinking, formulation of hypotheses and reinforcement of sequencing. Place 1 tbsp. of baby oil into a small bottle and add two to three drops each of three or four different colors of food coloring. Secure the lid tightly and shake so that all the ingredients mix together. Fill a large water bottle with tap water, pour the baby oil and food color mixture into it with a funnel, and note what happens. Because oil is not as dense as water, the water and oil will separate, and the food coloring will drop through the oil and disperse into the water, creating a colorful display that looks like liquid fireworks. Pour equal parts rubbing alcohol and water into a water bottle until the bottle is 1/8 to 1/4 full. Place a straw into the bottle, but do not let it touch the bottom. Use a piece of modeling clay to seal the top of the bottle and hold the straw in place. Hold your hands over the bottle to warm it. The mixture expands when it warms, creating a thermometer as the colored mixture moves up the straw. Cut away the bottom portion of a water bottle. Place the end of a small balloon into the water bottle and secure the lip of the balloon over the mouth of the bottle. Knot one end of a larger balloon and cut the other end off. Place the larger balloon over the cut bottom portion of the water bottle and use a rubber band to secure it in place. Hold the balloon tightly against the water bottle with your hand, and gently pull the knot of the balloon with the other hand. The balloon inside the bottle should start to inflate, simulating the expansion of the lungs when a person breathes in. Marie Liberty has been writing since 1998. She is the author of "Little Miss Right Now" and her articles have appeared in the "Blackwater Review," "Voices" and "Northwest Florida Daily News." Liberty is certified in elementary education and has a Master of Science in psychology from Troy State University. Liberty, Marie. "Water Bottle Science Experiments." 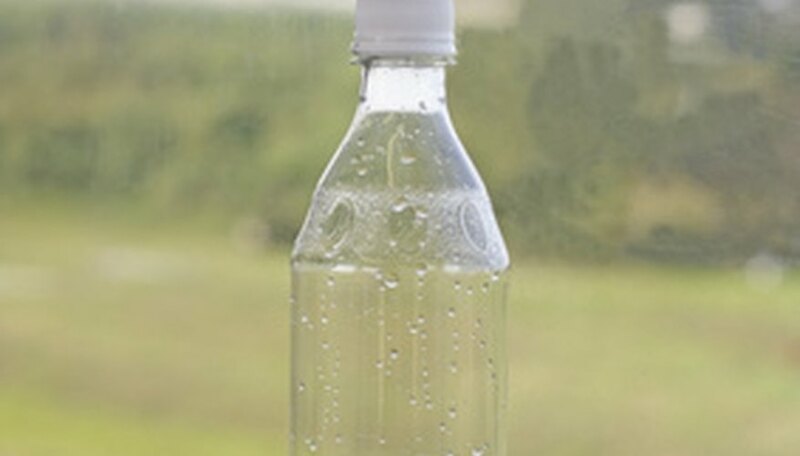 Sciencing, https://sciencing.com/water-bottle-science-experiments-7245653.html. 24 April 2017.